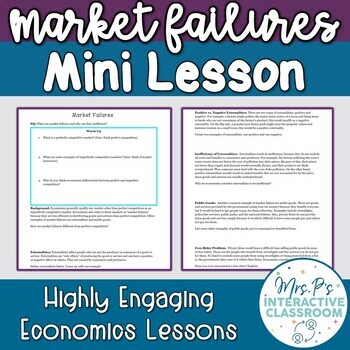 Market Failures Economics Mini Lesson! Markets are not always as efficient as economists might hope! That’s where market failures come in. With this short but impactful lesson, your students will gather a deeper understanding of how markets work and why they’re sometimes inefficient. This lesson will teach your students all about the inefficiency that occurs with market failures, specifically focusing on externalities and public goods. Your students will read definitions and examples, and then process this information by responding to written prompts throughout the worksheet. This worksheet assumes students already know about the 4 market structures and understand supply and demand.